Halloween is coming and what better way to celebrate it? 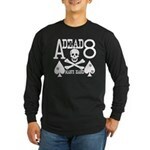 Wear your poker shirts that represent the Dead Man’s Hand. The Dead Man Hand Poker Shirts are available for Men & Women and come in all sizes. To browse all of our poker shirts you can click on any of the images on this page. All poker shirts come with a 100% satisfaction guarantee.